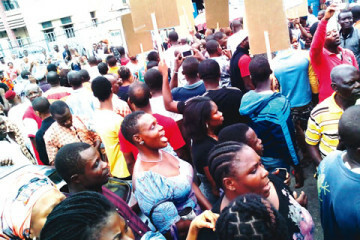 Thousands of Lagos residents on Thursday marched to the state’s headquarters of the Independent National Electoral Commission at Yaba to demand the release of their Permanent Voter Cards. “INEC deliberately hold our PVCs,” “Non-indigenes of Lagos State refuse to be disenfranchised,” “We want to vote, give us our PVCs,” had first converged on the Yaba Market before marching to INEC’s office, according to punchng.com. They were received by officials of the commission, led by the Resident Electoral Commissioner, Akin Orebiyi. Policemen from some police divisions in the state were also on hand to forestall a breakdown of law and order, as they formed a human shield around the INEC officials. The protesters, in their address, alleged that INEC was being partial in the distribution of the PVCs, adding that some officials of the electoral body had been compromised. The Chairman of Union of Non-indigenes in Lagos State, Francis Abang, said report from members of the group indicated that 70 per cent of them had yet to collect their PVCs.